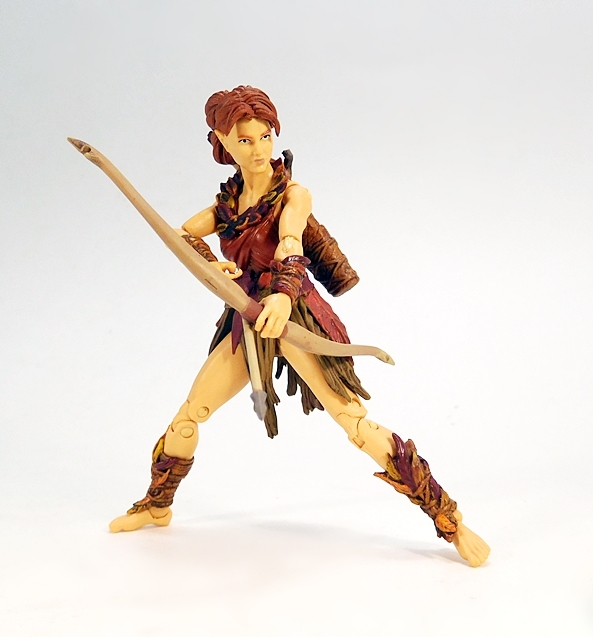 With the second wave of Vitruvian HACKS Series 2 upon us soon, I thought I’d better kick it into high gear and have a look at another figure from the initial wave. 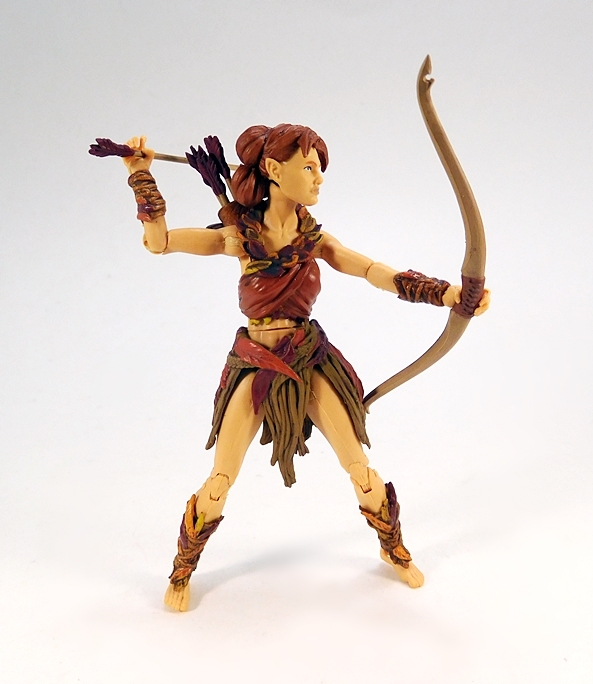 And with tomorrow being Thanksgiving, it seemed like the optimal time to check out Aiyana, the Autumn Elf Archer! I won’t go on about the packaging, because it hasn’t changed from Series 1, and we’ve already seen it twice in Series 2. It’s basically a horizontal card with a plastic bubble and covering, which allows it to display like a classic carded figure, but still be collector friendly. You get some nice artwork on the front, some character information on the back, and pictures of the other Series 2 figures that are available to collect. 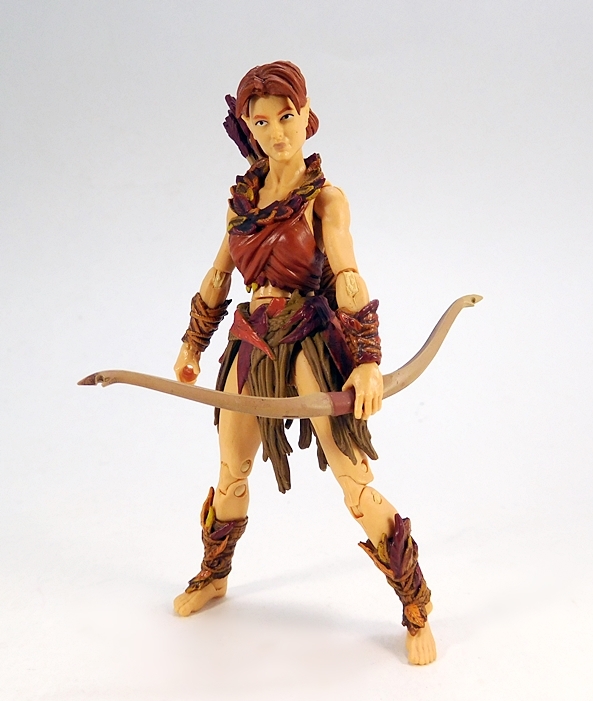 Aiyana harkens back to the Series 1 figures by offering a standard buck with all of her outfit sculpted in separate pieces and actually worn on the figure. It’s quite an achievement for 4-inch scale figures, and since it’s all removable, it gives you some options to mix and match with other figures if you want. The costume certainly has a strong autumn flavor and includes a separate top and bottom, as well as wrist and ankle bracers. 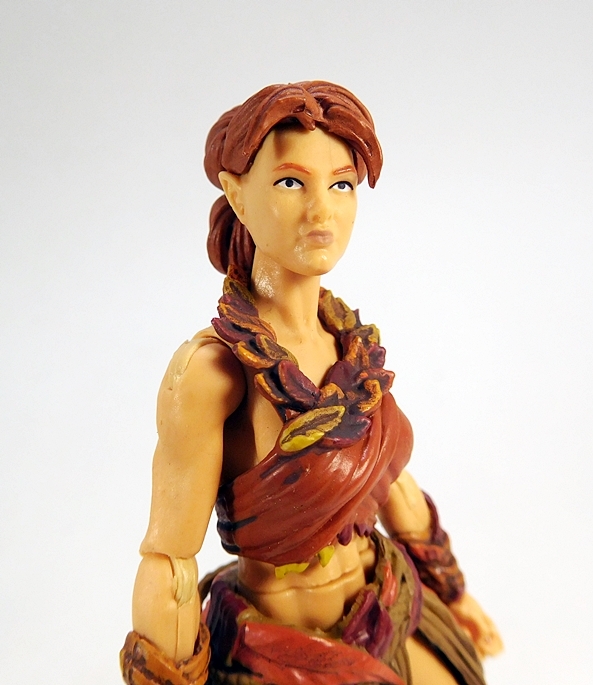 All of the pieces are sculpted with fall colored leaves, cloth, and what looks like vines or twine, giving the outfit a very primitive look. What doesn’t look primitive is the craftsmanship that went into the sculpt and paintwork. The detail on the tiny leaves and wraps is quite extraordinary and the mix or orange, yellows, and browns makes me want to run outside and play in a leaf pile. 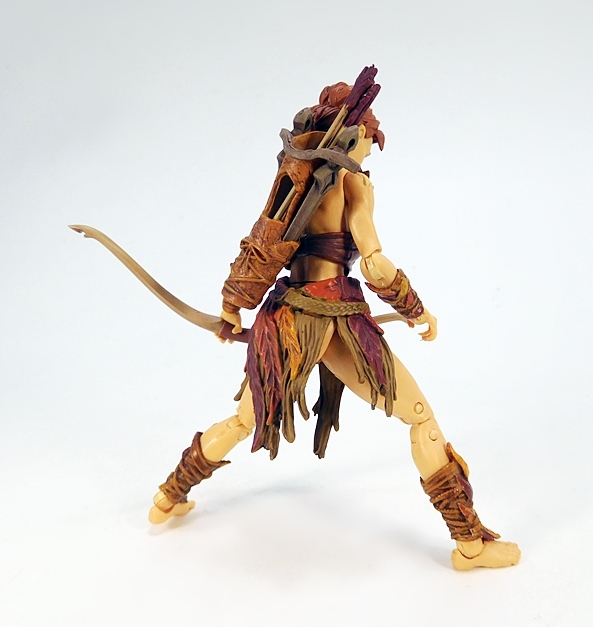 There’s a hole in Aiyana’s back, which we’ll soon see can equip her quiver, but it can also take a peg from any number of import figure stands for those action poses. I’ve covered the articulation in these female bucks quite a few times in the past, so I’ll forgo it here and refer you back to one of my earlier reviews. I like the head sculpt well enough, although from certain angles the lips can look a little odd. The hair is sculpted from a separate piece and the way the bangs hang over the forehead gives it a nice sense of depth. 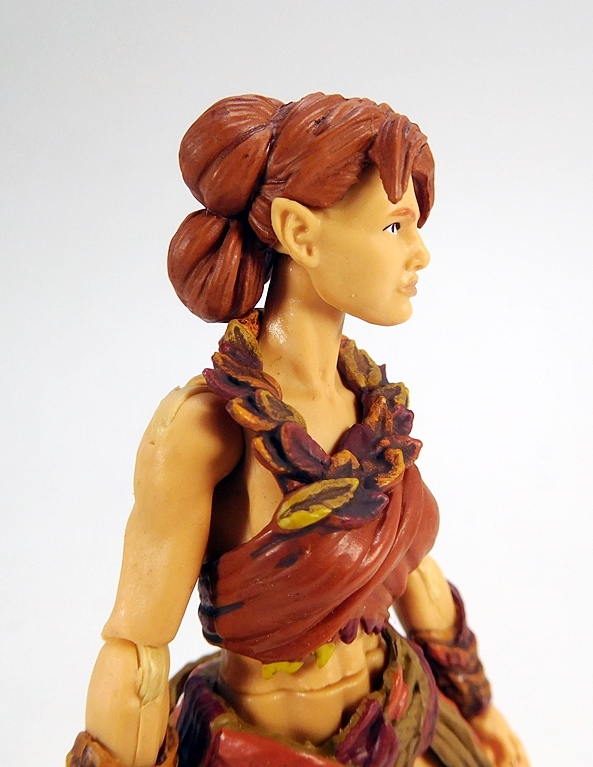 The paint on her eyes, eyebrows, and lips is fairly simple, but applied with precision, and her pointed ears are a lot more understated than what we saw on Laguna, her cavern dwelling cousin a few weeks back. 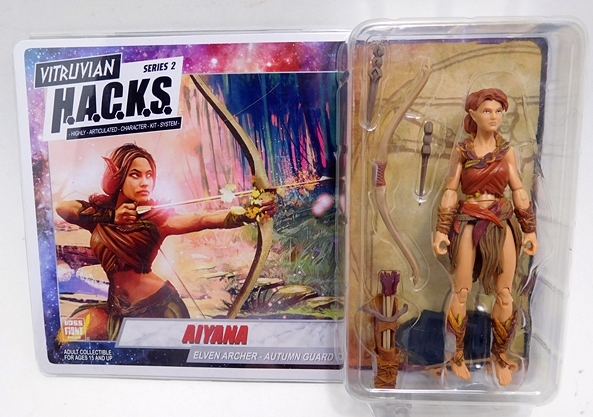 As an archer, Aiyana comes with the tools of her trade, which include a bow, a quiver, and a bunch of arrows. 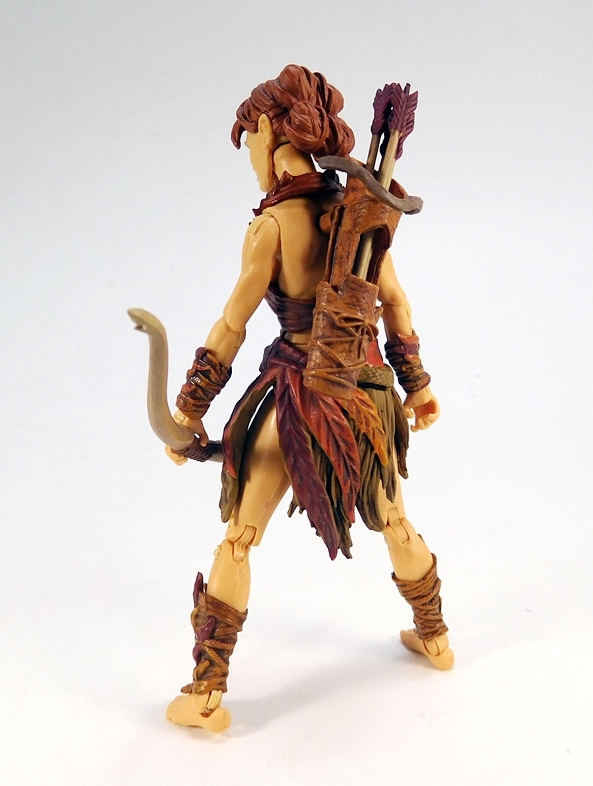 The quiver pegs right into the hole in her back and is painted to look like leather. It has some sculpted lacings holding it together and it can comfortably hold three arrows, but I can get a fourth one in there if I really want to. 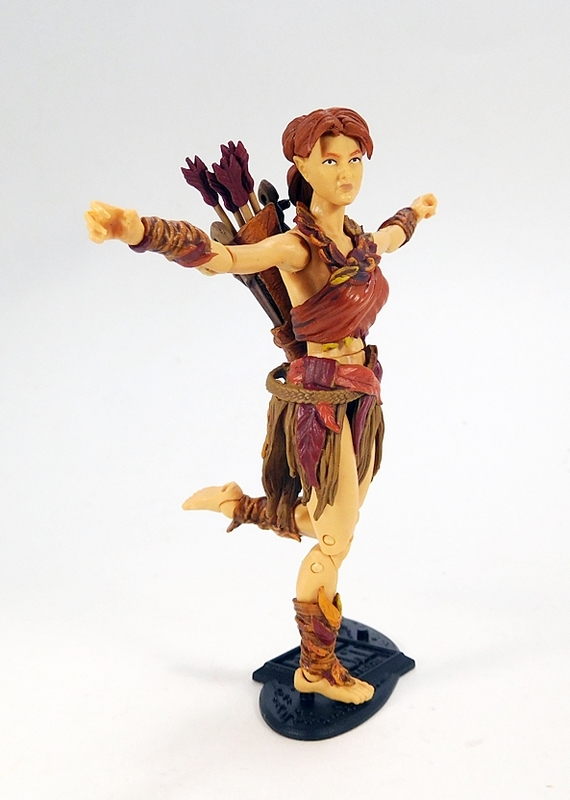 The figure actually comes with six arrows total. The bow is a pretty simple sculpt, with a painted grip, and there are notches in the ends so that you can string it if you want. I may eventually do that, but for now, I left it the way it is, so we’ll just have to use our imaginations. Aiyana features breaks in between her fingers where she can hold the arrows very securely and knock them into our imaginary bow string. 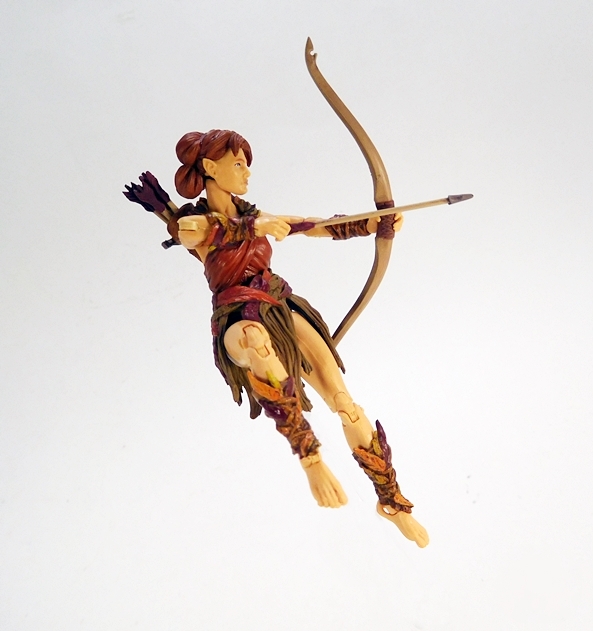 The articulation works beautifully too, so you can get some nice poses of her withdrawing an arrow from her bow, or preparing to shoot. What happens when an Autumn Elf runs out of arrows? She relies on her twin daggers, and I absolutely love the distinctive designs on these fearsome blades. There are slots on each side of her quiver where you can store these. Or if you prefer, there’s also a loop on the back of her skirt where you can tuck both of these into. 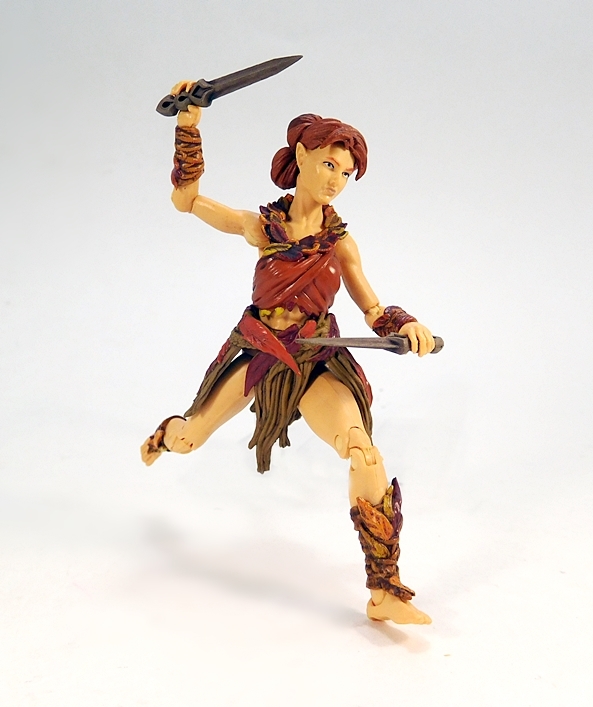 I’m not sure if this is the intention, as I have a little fore knowledge about what this is used for on another figure, but I think it works pretty well for the daggers. Either way, it’s possible to get her to carry all her gear on her at once, well… except for some of those surplus arrows. 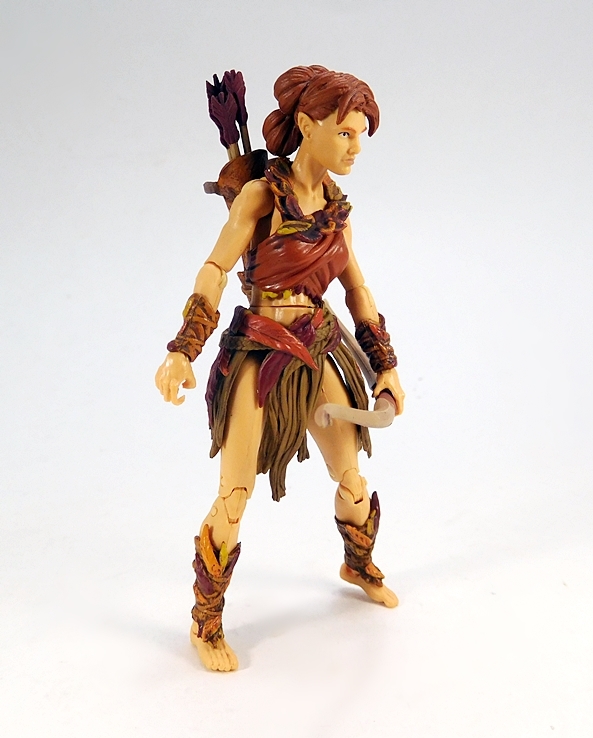 In addition to the weapons and extra arrows, Aiyala comes with some extra hands and the standard Boss Fight Studio figure stand. The pegs do not go that far into the holes on her feet, but I was still able to get it to work. 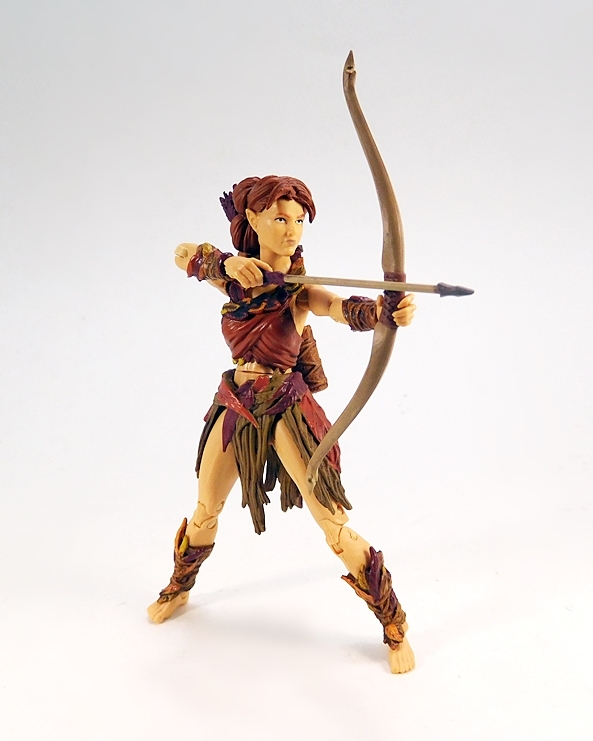 I should also note that this figure has some incredible balance and even with a quiver full of arrows on her back, she can stand pretty well on those tiny bare feet without the aid of a stand. The mid-air poses and one legged stances? Well, that’s a different story. 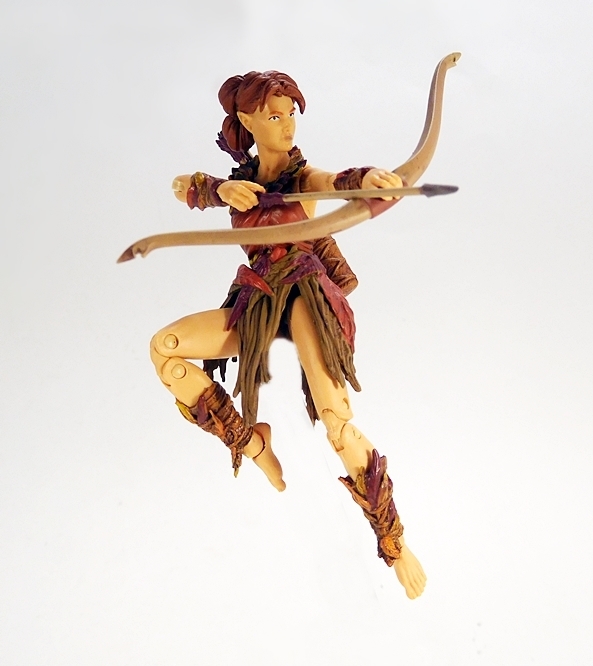 So far, Vitruvian HACKS Series 2 is firing on all cylinders. And while I confess to grumbling a little about having to leave the Greek Hoplites and snake monsters of Series 1 behind, it hasn’t taken long for this new Fantasy theme to win over my heart. I really dig the diversity of this first wave, especially the fairies and the elves. And we haven’t even met The Orcs yet. But I’ll remedy that the next time I revisit this series. 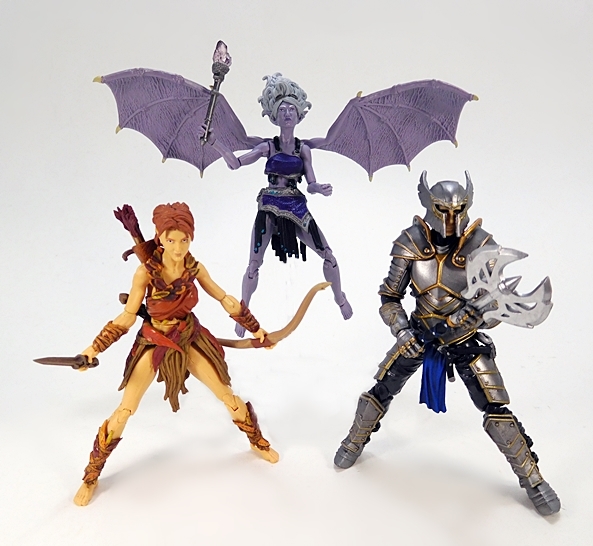 In the meantime, these figures should still all be available on Boss Fight Studios’ webstore and even at about $25 a piece, I’ve got no complaints! And just a reminder, I am taking tomorrow off for Thanksgiving, but Transformers Thursday will be back next week, and I am planning on being back the following day with DC Friday. In the meantime, I have plenty of things to be thankful for, but I’m particularly thankful for everyone that reads my toy nonsense, comments, emails or tweets me. I have met so many wonderful people doing this silly blog, and you all make it worthwhile. I count so many of you among my friends, even the ones I’ve never met. Have a happy Thanksgiving, be well and be safe! 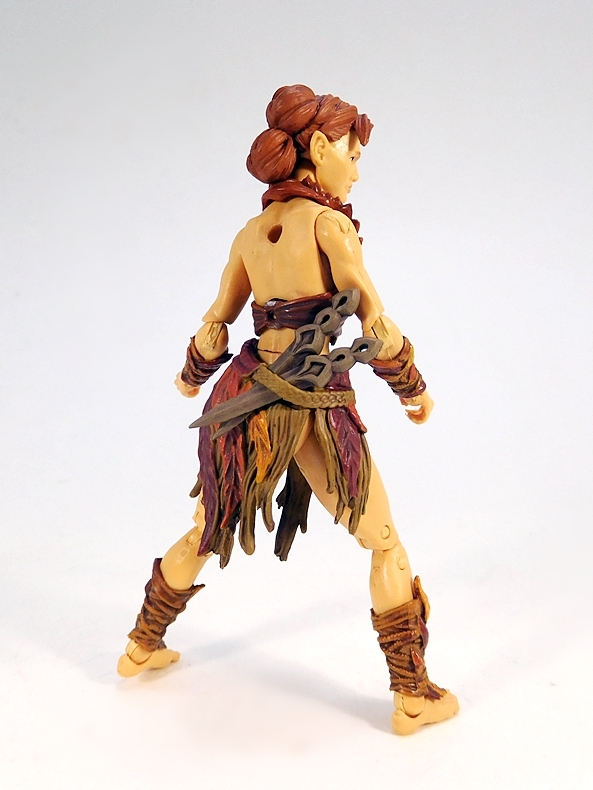 They are doing some great work on such small figures, but I have to nitpick a little: the hair on this gal looks kinda iffy. It looks like a giant squirrel, upon seeing her autumn-themed clothes, decided it’s time to find a spot to hibernate, then curled up on her head and fell asleep. It looks like a poorly-fitted wig than actual hair! It needs to sit lower on the skull, and closer to the scalp.